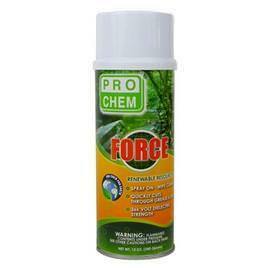 Force | Pro Chem, Inc.
FORCE is a blend of 100% organic solvents that couples the power of citrus with the safety of soy to rapidly cut through tough grease, oil and grime on hard surfaces without the hazards associated with chlorinated solvents or petroleum distillates. With its high dielectric strength, controlled mist delivery and mild citrus aroma, it is ideal for precision work in the shop, on the production floor or in the field while its high solvency provides the ability to handle tough grease, oil, grime, wax, ink and more, for less delicate applications. Spray onto surface from a distance of 8 to 10 inches and allow 1 to 3 minutes to penetrate through grease, oil and grime. Wipe clean or use second application to rinse surfaces and wipe dry. For heavily encrusted parts, agitate wetted surfaces with a brush prior to rinsing with a second application.